Brouwerij Boon moved their brewing facilities in the 1980s from their original location where beer had been made since the 1680s. Frank Boon, who has been very helpful to “outsiders” wishing to learn the intricacies of lambic brewing, has owned and operated the brewery since 1978. They produce a faro, a framboise, a kriek, an oude kriek (old or aged kriek), a strong brown, and two gueuzes. 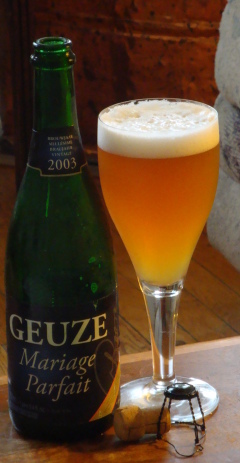 Their Oude Gueze is a blend of six month and two year lambics. Their Mariage Parfait is the blend of the best individual casks and is intended as the brewery’s finest product. As with a number of selections for Sour Week, I obtained this bottle at Lush on Halsted in Chicago. It is a vintage 2003, bottled, I believe, in 2007. In case you were curious, the best before date is 3 Feb 2027, totally beating my previous furthest-in-the-future best-before-date of sometime in 2013 (on a case of Unibroue Quelque Chose). The Mariage Parfait pours a lightly hazy saffron. The head is a generous creamy long-lasting white. The nose is delicate, dry, and dusty, the aroma that of a farmhouse attic, with barnyard character drifting in through an open window. Grass and straw, dust and must, wood, horse, and goat. Subtle, complex, and elegant, the aroma on this beer seems light at first but will fill and tantalize your nose. Initially fruity, the taste quickly turns strongly tart. A mostly clean lactic acidity is supplemented by shades of acetic. Tastes much like champagne on the middle of the tongue but with kiwi, pineapple, and grapefruit on the front and malt on the sides. Just a bit of horsey and sweaty funk. A hint of husky astringency and hop bitterness. The flavor is bold yet balanced and complex yet approachable. A quite active carbonation offsets the lingering acidity. This delicate masterpiece is the beer to give to your (crazy) friend who loves wine but thinks all beer is gross. Note: Both gueuze and geuze are acceptable spellings for the style.